As Hannah Brown signed her national acceptance letter to play college soccer, she thanked everyone that helped her get where she is, including the South Haven Boys & Girls Club. Hannah was introduced to soccer at the Club when she was a young member. She will now be attending college on both academic and athletic scholarships. The Clubs helped teach her good sportsmanship and fair play at a young age and now she is following her dreams of playing soccer at the next level. Join the growing group of alumni and reconnect with your childhood Club. There are many ways to get involved with Boys & Girls Clubs of Greater Northwest Indiana. Stay connected with your local Club by receiving e-newsletters and following us on Facebook and Twitter. Volunteer at a local Club to help make GREAT Futures. Sponsor a Club member for only $35 a year. An annual membership is only $35 a year for our Club members. Help a Club member stay in the Club by sponsoring a child. Attend an event. We have three major events and several smaller events that happen year-round. 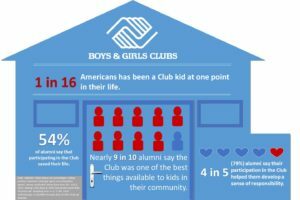 For questions about the Alumni Club, contact Farren Felus at ffelus@bgcgreaternwi.org or (219) 764-CLUB or visit your local Club.